Whether subsidies are positive or negative is typically a normative judgment. As a form of economic intervention, subsidies are inherently contrary to the market's demands. [ citation needed] However, they can also be used as tools of political and corporate cronyism. A production subsidy encourages suppliers to increase the output of a particular product by partially offsetting the production costs or losses. The objective of production subsidies is to expand production of a particular product more so that the market would promote but without raising the final price to consumers. This type of subsidy is predominantly found in developed markets. Other examples of production subsidies include the assistance in the creation of a new firm ( Enterprise Investment Scheme), industry ( industrial policy) and even the development of certain areas ( regional policy). Production subsidies are critically discussed in the literature as they can cause many problems including the additional cost of storing the extra produced products, depressing world market prices, and incentivizing producers to over-produce, for example, a farmer overproducing in terms of his land's carrying capacity. A consumption subsidy is one that subsidises the behavior of consumers. This type of subsidies are most common in developing countries where governments subsidise such things as food, water, electricity and education on the basis that no matter how impoverished, all should be allowed those most basic requirements. For example, some governments offer 'lifeline' rates for electricity, that is, the first increment of electricity each month is subsidised. This paper addresses the problems of defining and measuring government subsidies, examines why and how government subsidies are used as a fiscal policy tool, discusses their economic effects, appraises international empirical evidence on government subsidies, and offers options for their reform. Evidence from recent studies suggests that government expenditures on subsidies remain high in many countries, often amounting to several percentage points of GDP. Subsidization on such a scale implies substantial opportunity costs. There are at least three compelling reasons for studying government subsidy behavior. First, subsidies are a major instrument of government expenditure policy. Second, on a domestic level, subsidies affect domestic resource allocation decisions, income distribution, and expenditure productivity. An employment subsidy serves as an incentive to businesses to provide more job opportunities to reduce the level of unemployment in the country (income subsidies) or to encourage research and development. With an employment subsidy, the government provides assistance with wages. Another form of employment subsidy is the social security benefits. Employment subsidies allow a person receiving the benefit to enjoy some minimum standard of living. Government can create the same outcome through selective tax breaks as through cash payment. For example, suppose a government sends monetary assistance that reimburses 15% of all health expenditures to a group that is paying 15% income tax. Exactly the same subsidy is achieved by giving a health tax deduction. Tax subsidies are also known as tax expenditures. As well as the conventional and formal subsidies as outlined above there are myriad implicit subsidies principally in the form of environmental externalities. These subsidies include anything that is omitted but not accounted for and thus is an externality. These include things such as car drivers who pollute everyone's atmosphere without compensating everyone, farmers who use pesticides which can pollute everyone's ecosystems again without compensating everyone, or Britain's electricity production which results in additional acid rain in Scandinavia. In these examples the polluter is effectively gaining a net benefit but not compensating those affected. Although they are not subsidies in the form of direct economic support from the Government, they are no less economically, socially and environmentally harmful. Conversely broad subsidies include both monetary and non-monetary subsidies and is often difficult to identify. A broad subsidy is less attributable and less transparent. Environmental externalities are the most common type of broad subsidy. Competitive equilibrium is a state of balance between buyers and suppliers, in which the quantity demanded of a good is the quantity supplied at a specified price. When the quantity demand exceeds the equilibrium quantity, price falls; conversely, a reduction in the supply of a good beyond equilibrium quantity implies an increase in the price. 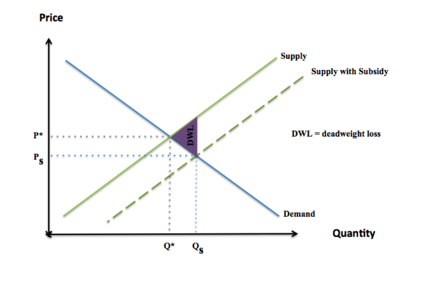 The effect of a subsidy is to shift the supply or demand curve to the right (i.e. increases the supply or demand) by the amount of the subsidy. If a consumer is receiving the subsidy, a lower price of a good resulting from the marginal subsidy on consumption increases demand, shifting the demand curve to the right. If a supplier is receiving the subsidy, an increase in the price (revenue) resulting from the marginal subsidy on production results increases supply, shifting the supply curve to the right. Cotton growers in the US reportedly receive half their income from the government under the Farm Bill of 2002. The subsidy payments stimulated overproduction and resulted in a record cotton harvest in 2002, much of which had to be sold at very reduced prices in the global market. For foreign producers, the depressed cotton price lowered their prices far below the break-even price. In fact, African farmers received 35 to 40 cents per pound for cotton, while US cotton growers, backed by government agricultural payments, received 75 cents per pound. Developing countries and trade organizations argue that poorer countries should be able to export their principal commodities to survive, but protectionist laws and payments in the United States and Europe prevent these countries from engaging in international trade opportunities. Today, much of the world's major fisheries are overexploited; in 2002, the WWF estimate this at approximately 75%. Fishing subsidies include "direct assistant to fishers; loan support programs; tax preferences and insurance support; capital and infrastructure programs; marketing and price support programs; and fisheries management, research, and conservation programs." They promote the expansion of fishing fleets, the supply of larger and longer nets, larger yields and indiscriminate catch, as well as mitigating risks which encourages further investment into large-scale operations to the disfavour of the already struggling small-scale industry. Collectively, these result in the continued overcapitalization and overfishing of marine fisheries. ^ a b c d e f g h Myers, N. (1998). "Lifting the veil on perverse subsidies". Nature. 392 (6674): 327–328. doi: 10.1038/32761. ^ James, A.N. ; Gaston, K.J. ; Balmford, A. (1999). "Balancing the Earth's accounts". Nature. 401 (6751): 323–324. doi: 10.1038/43774. PMID 16862091. ^ a b c van Beers, Cees; van den Bergh, Jeroen CJM (2009). "Environmental Harm of Hidden Subsidies: Global Warming and Acidification". AMBIO: A Journal of the Human Environment. 38 (6): 339–341. doi: 10.1579/08-A-616.1.